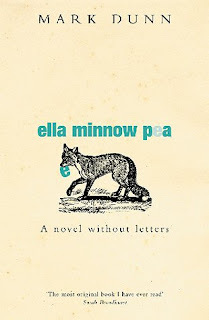 I found Ella Minnow Pea by Mark Dunn to be utterly charming. I read it very quickly and found myself smiling on more than one occasion. I absolutely adored this book. It's epistolary, which I didn't realise until recently is a genre that I love, and it's dystopic which just makes it even more fabulous. It's the story of a fictional island, Nollop, who reveres Nevin Nollop, the creator of the pangram 'the quick brown fox jumps over the lazy dog.' A statue is erected in his honour, but when the tiles from this statue start falling off, the government believe that this is a direct sign from Nollop himself that those letters should no longer be used either verbally or written and create new laws accordingly. The first letter to fall is the letter 'z' which doesn't seem like it would affect life in any major way, no? Then more and more letters fall, and life becomes increasingly difficult for the citizens of Nollop. This book is saying something about censorship, freedom of speech, totalitarian states. But it's doing it in a very quirky, fun and light-hearted way. It's also a book for people who love language. In fact it took me a few pages to accustom myself to the different vocabulary used by the Nollopians, but once that happened, I found this book to be original, fun and very clever. You'll finish this book with a better appreciation of the English language. It was an excellent way to spend an afternoon and I highly recommend it. I was lucky enough to grab a copy of this on Bookmooch the other day :D I have a feeling I'll love it. I love what you said about it being a book for lovers of language! I've seen lots of wonderful things about this book! It's on my list to acquire after my book ban is over since my libraries don't have it. Sounds fascinating, will have to keep an eye out for that one. I have had this on my wish list for a while. I'm pleased that you like it and will keep my eyes peeled for a copy. Thanks for reminding me about it! This is one of those books I hear about often, but somehow I always seem to miss a concise summary. It sounds amazing! Going on my library list immediately.